French organist-composer Jean Langlais was blind from birth, and Samuel Coquard, who directs this estimable recording, believes that this was an important factor contributing towards the simplicity, humility and emotion to be found in all his music. 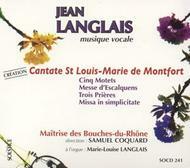 The works on this disc cover a period of over 20 years in the composer�s output, and include the world premi�re recording of the unpublished �Cantata in Honour of Saint Louis-Marie de Montfort�. Deeply-felt performances from the excellent children�s choir.